The Northland Pines baseball team will look to five returning letterwinners to help the team improve on last year’s 5-15 overall record under coach Peter Aerts. 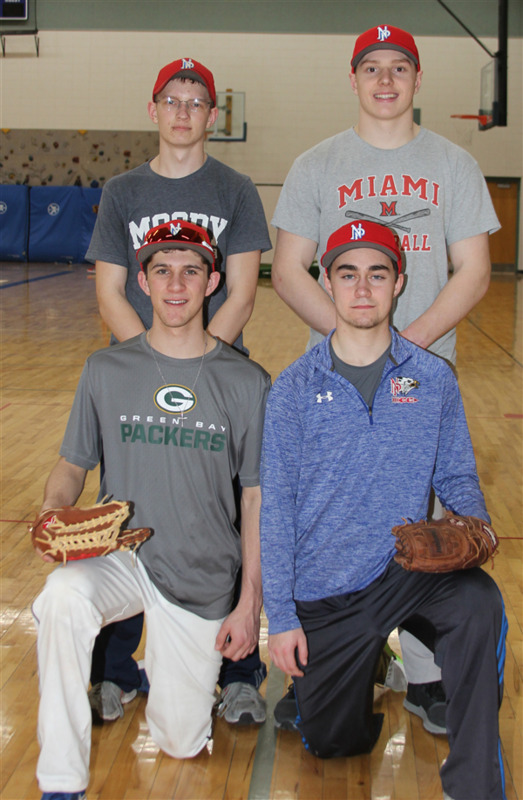 The Eagles graduated six seniors (four everyday start­ers) last year, including four-year varsity starter and conference honorable mention pitcher Josh Meier. But the Eagles are returning four seniors in Ben Tilley (honorable mention infield), Tucker Wittkopf (honorable mention utility), Nathan Hopkins (honorable mention outfield) and Patrick Heck, along with sophomore Lars Evensen. Aerts said the seniors are good leaders. Aerts said the team strengths include that senior leadership and overall playing experience. “Our depth will also be significantly improved this year with many underclassmen pushing for a varsity spot while we already have a good player group in our junior and senior classes,” he said. Nonetheless, Aerts said the Eagles are still building a baseball program. Looking at the Great Northern Conference (GNC), Aerts said the Eagles want to continually increase their competitiveness in conference. “Last year, we were in a lot of games and proved at times that we can compete with even the best teams in a talented baseball conference,” he said. “This team’s work ethic and the positive culture they are creating should allow them to be even more competitive this year. Assisting Aerts this spring are Robert Govek, Jeff Janssen, Marc Groth, Isaac Haiduk, Jacob Hodgdon and Ken Jackson. Northland Pines opened the season last Sunday at the Woodside Sports Complex in Wisconsin Dells on their turf fields, playing a doubleheader against Manawa. The Eagles beat Manawa 5-3 in game one and 12-10 in game two. “We put together great at-bats in game one and found ways on base,” said Aerts. “We utilized our speed, stealing eight bases. It was a great start by Nathan Hopkins on the mound, giving us six innings without a walk. Lars Evensen came in to close the final inning and attacked hitters, only needing eight pitches. Hopkins led Pines at the plate, going 2-for-3 with one stolen base and two RBIs. Logan Hissom was 2-for-2, with a triple, stolen base and one RBI. Tilley was 1-for-2, with two walks, three stolen bases and two runs scored. Evensen was 1-for-3 with a triple and Bradley Stephens was 1-for-3 with a run scored and one RBI. Hopkins went six innings on the mound, allowing six hits and three earned runs. He struck out four and had no walks. Evensen got the save with one strikeout and no walks. “The second game we were able to get an early lead and then move guys around. Mitch McCanles and Bradley Stephens were lights out on the mound and threw fantastic, both not walking a batter,” said Aerts. The game got tight at the end and Sam Johnson came in to relieve with the tying run at the plate and striking out the only two batters he faced to end the game. Tilley led the Eagles offense going 2-for-2 with a triple, two walks, two runs and one RBI. Hopkins was 1- for-1 with a walk, two stolen bases, one run and one RBI. Johnson had two walks, scored two runs and had two stolen bases. On the mound, McCanles pitched two innings, allowing no hits, no walks, and he had two strikeouts. Stephens pitched one inning, allowing one hit. He had one strikeout and no walks. Johnson pitched two-thirds of an inning with no hits, no walks and two strikeouts. Pines, 2-0 overall, was scheduled to open the GNC with a doubleheader at Antigo on Tuesday of this week. Pines is scheduled to play at Crandon this Friday, April 12, in a nonconference game at 4 p.m., through snow is in the forecast for the North Woods this Thursday and Friday. The Eagles home opener is scheduled for Monday, April 15, against Laona-Wabeno, at 5 p.m.